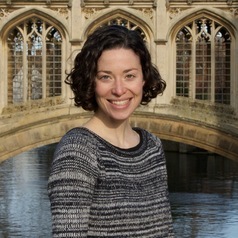 Helen Anne Curry is a lecturer in the Department of History and Philosophy of Science at the University of Cambridge. She is a fellow of Churchill College. Curry's recent research has charted the history of plant breeding in the United States and especially the innovation of novel techniques for genetic manipulation. Her book, Evolution Made to Order: Plant Breeding and Technological Innovation in Twentieth Century America, is forthcoming from University of Chicago Press in October 2016. In it, she traces the history of several early technologies used to modify genes and chromosomes, including their development as research tools in genetics and evolutionary biology, their application as novel methods of plant breeding, and their celebration in American popular culture as means of engineering life. More recently, Curry has begun to investigate the history of global conservation, in particular the history of efforts made to preserve the genetic diversity of agricultural crop species through the creation of seed banks. This work has been supported by the Rockefeller Archive Center and the Centre for Research in the Arts, Social Sciences, and Humanities at the University of Cambridge and will be the focus of a Wellcome Trust Seed Award in 2016–17.